What year is it again? 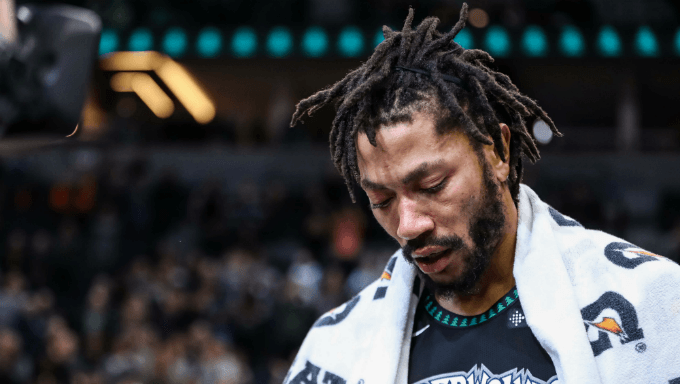 Derrick Rose threw it all the way back to his healthy ACL days on Wednesday night, dropping a career-high 50 points in the Minnesota Timberwolves’ overtime victory against the Utah Jazz. The former league MVP went 19 of 31 from the field, made four 3-pointers and got to the free-throw line 11 times. He even added six assists in his first start of the year, with Jeff Teague out battling a knee injury. Teague’s injury doesn’t seem too serious, which means Rose will move back to the bench moving forward. And that’s good news for his Sixth Man of the Year prospects and for savvy NBA betting fans. It’s rare that we’re discussing a league MVP as a potential Sixth Man of the Year, especially at 30 years old. But Rose’s career path has been unlike anyone else’s, so here we are discussing him as a potential top reserve. Rose’s 50-point explosion wasn’t the first time he’s performed well this year. Prior to that outing he was still averaging a respectable 14.3 points and 4.9 assists per game in just 28.4 minutes per game. Tyus Jones is still around, which is keeping Rose’s minutes from being in the 30s, but if Rose continues to play this well he’ll see his minutes increase. He might also see a significant uptick in usage if and when the Timberwolves trade disgruntled superstar Jimmy Butler. Rose will also get a bump in name value alone. He’s a great comeback story. If he can stay healthy – always an unfortunate concern for him – he’ll continue to make headlines with his impressive play. In September we analyzed what goes in to winning Sixth Man of the Year. We looked at four different factors, and Rose fits the bill on all four. Rose is 30 years old and in his 10th NBA season. The last 11 winners of the Sixth Man award have been 30.3 years old and in Year 9.7. Rose is essentially the definition of an average winner. The Wolves are paying Teague $8 million so he’s going to stick in the starting lineup, while Rose has infused the Minnesota second unit. This could change when Butler is dealt, especially if Tom Thibodeau values players to help him win now over prospects, but the Timberwolves are 4-4. Most Sixth Man winners are on winning teams, but last year Lou Williams won while playing for the 42-win Clippers. Even if Butler is dealt, this team still touts Karl-Anthony Towns, Andrew Wiggins, Teague, Rose and whoever comes back in the trade. They should flirt with 42-46 wins when it’s all said and done. No, Rose isn’t a shooting guard. And no true point guard has won the award since 1999. But past winners like Lou Williams, Jamal Crawford and Lamar Odom were essentially point guards, acting as primary ball handlers on the second unit. That’s Rose, who has even shown some ability from beyond the arc; he’s currently shooting 34.6 percent from deep, which would be a career-high. Sixteen of the last 17 Sixth Man award winners have finished in the top three in bench scoring, and 11 have been the leading scorers off the bench. After Wednesday night it’s clear that Rose won’t have any trouble scoring this year – he also had a 28-point outing in the Wolves’ second game of the year. Through the first three weeks of the season Rose leads all reserves in scoring, with J.J. Redick, Julius Randle and Lou Williams close behind. He probably won’t top 50 points again, but Rose is healthy and ready to attack defenses like he did in 2011. He’ll score with ease.